Turfcare Specialists Limited offer 2 standard types of Tee Mats/Golf Driving Mats from Verde Sports, both available in various sizes, ideal for use in driving ranges, out on the course or home practice use. All of our Golf Mats come with pre-fused holes and are supplied complete with the rubber tees to suit (tubular tees for practice use and crossed rubber grommets for course use). Slots are available in the ** Two Star option (no rubber tees supplied). The *** Three Star Verde Golf Mat has been established over 23 years and is known for its playing characteristics and quality, both on the course and in the driving ranges. 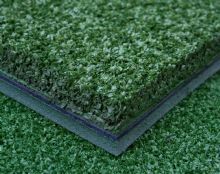 The *** Three Star Verde Golf Mat has a 15mm polypropylene playing surface with a unique 10mm polyethylene foam backing. This soft foam contributes to its natural playing characteristics and is very forgiving if the golfer drives straight off the mat. An intermediate stiff felt layer is provided to prevent any indentations, strengthen the mat and extend its proven long life. Rubber tees are supplied free of charge. Please specify which you require and the relevant holes will be pre-fused. Course – 6 x Crossed Rubber Tees. Range – 4 x Tubular Tees. The ** Two Star Verde Golf Mat was introduced over 18 years ago for golf courses who preferred a heavier mat with a solid construction. 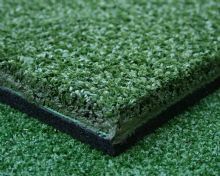 This ** Two Star Verde Golf Mat has the same 15mm polypropylene playing surface as the *** Three Star Verde Golf Mat, but is bonded directly to the firmer 10mm rubber crumb backing. The complete mat is twice as heavy as its *** Three Star sister but sits securely in temporary positions. Choice of Rubber Tees or Slots (we recommend tees). Rubber tees are supplied free of charge. Please specify which you require and the relevant holes will be pre–fused. Course – 6 x Crossed Rubber Tees. Range – 4 x Tubular Tees. Inserts – no holes or slots. 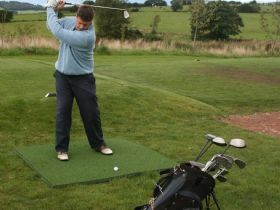 The 1.50m by 1.50m golf mat is supplied as square, round or octagonal.